I knew when I selected “flag on the moon” I didn’t want to do a typical flag image, so I choose to have the eagle represent the American flag. I used the Apollo 11 Mission Patch as my inspiration. I choose the name, “High Flying Flag” as there aren’t many that fly higher…forever in peace may she wave. 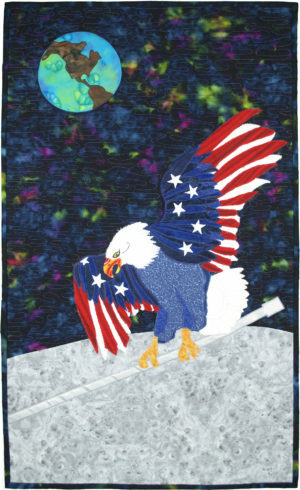 The quilt was created using raw edge applique as I wanted the feathers of the eagle to have a wispy, feathery finish to them to give them movement. There is a small amount of trapunto and it is machine quilted.